"Changing Hearts and Minds," by Garrett Dahm, Cameron Dumas, Ellis Herring, Lauren Hicks, and Taylor Torrence, Episcopal School of Baton Rouge. For our project, we decided to create a sculpture to depict what we thought a world without prisons might look like. 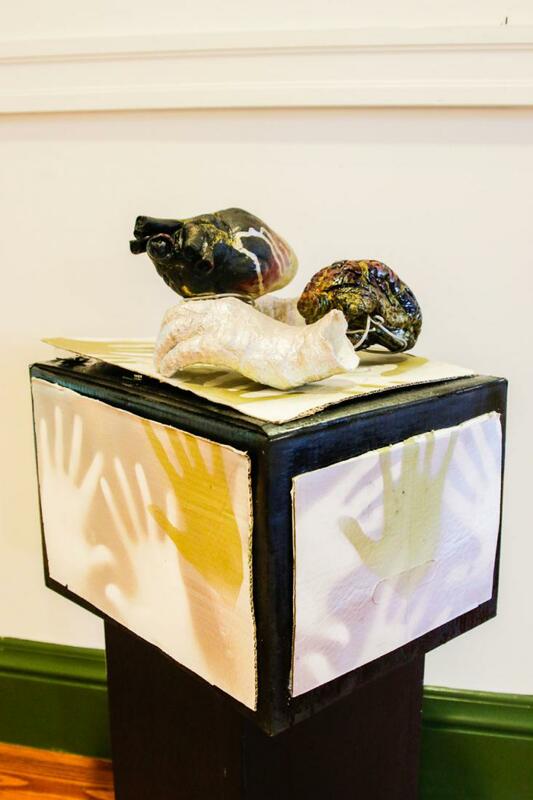 The sculpture we created is a simple box with two human hands rising out of it. Resting in the palms of the hands is a human heart and brain. The hands are silver and gold, representing community love and support. Those colors, which stand for purity, virtue, integrity, and love, filter through the hands and into the heart and brain, transforming them from black (sadness, pain, brokenness, hate, deprivation, evil) to purity, unity, and love. The heart and mind represent not only men and women who have been incarcerated, but that part of society from which violent crime emerges. Impacted by influences such as poverty, addiction, poor education, unemployment, and mental illness-as well as poor moral choices-they are dark until, through hands of a supportive society (including churches and other community groups)-the sadness and evil are replaced with love. The complete sculpture represents the community holding up love, education, and unity as the most important aspects of a healthy, harmonious society.